SOR 57: What’s the Best Way To Use Flyers? 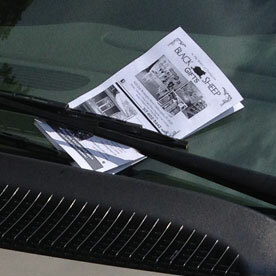 Flyers can be effective marketing tools, but how can you use them without annoying people or getting in trouble with the authorities? I have a great listener question in this episode. Joni shares that booking agents she’s worked with swear up and down by using flyers to promote shows. She’s running into legal issues and wants to know what’s the right way to use them. The short answer is I think flyers can be a fantastic promotional tool, although I’m not a fan of how most people use them. I share my thoughts, and of course if you have a theatre marketing question of your own you can ask it here. Thanks to Joni for the question, and thank you for downloading and listening. Thanks so much for your reply to my question, Clay. Sold Out Run has been such a great resource for my show marketing efforts!